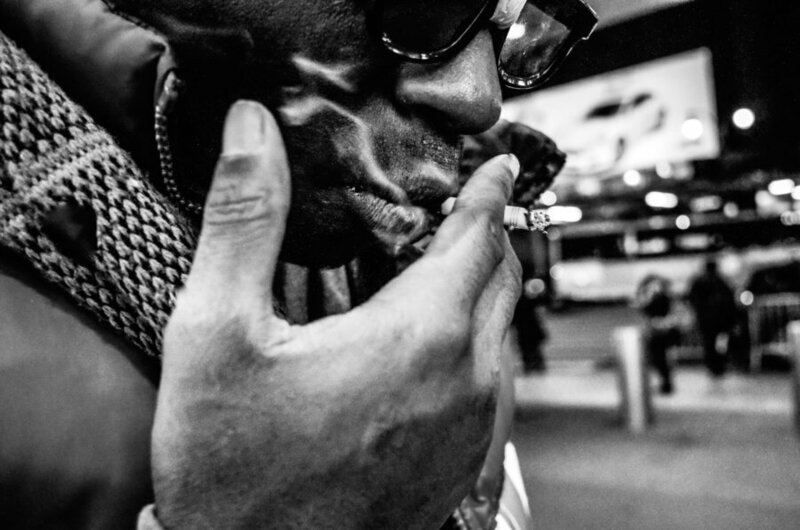 Today I like to share with you my Ricoh GR Zone Focusing Tips for Closeup Street Photography using Snap Focus, Full Press Snap Focus and Manual Focus Mode. The tips are especially useful when shooting in fast-paced, closeup situations where you can not rely on the slow Auto Focus performance. 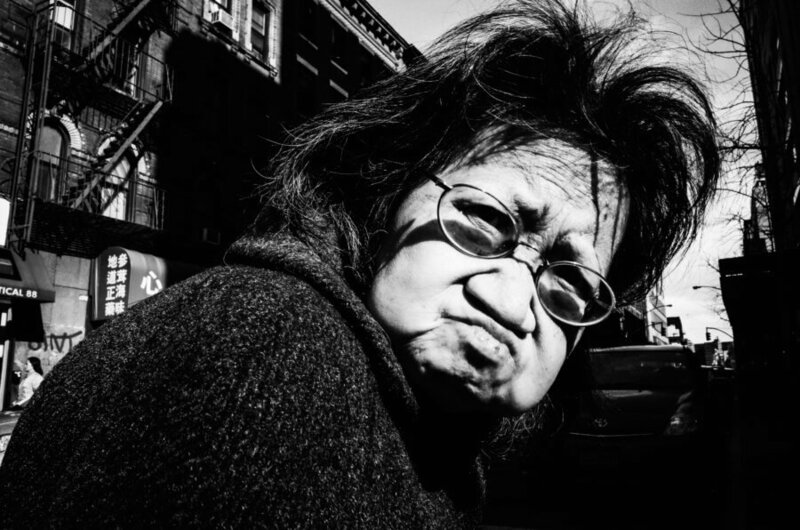 To get an impression of such situations consider watching a short documentary video about Jeff Mermelstein´s or Bruce Gilden´s working approach. 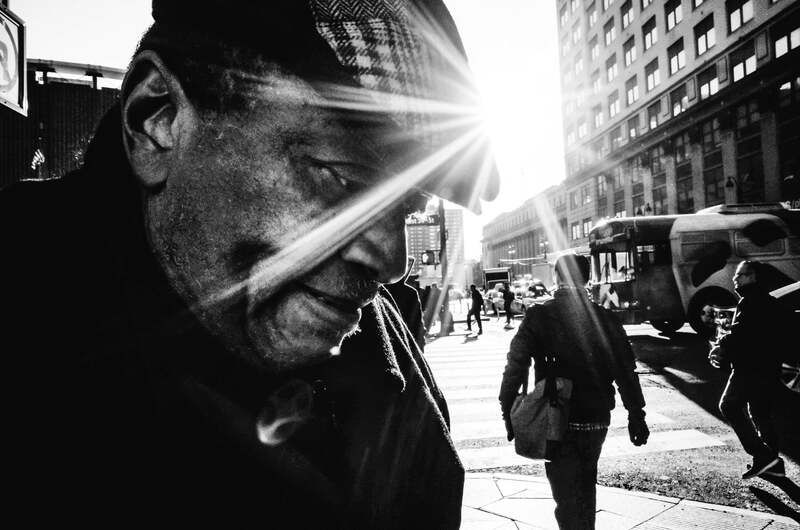 Both are renowned Street Photographers from New York City. Notice how near and quickly they make their pictures! Snap Focus – A dedicated focus mode that allows you to shoot using one of the six predefined focus distances (1 m, 1,5 m, 2 m, 2,5 m, 5 m or Infinity). Full Press Snap Focus – A function to directly override Auto Focus and shoot using one of the six predefined Snap Focus distances. Manual Focus – A dedicated focus mode that allows you to set the desired focus distance anywhere between 6 cm (GR III), 10 cm (GR & GR II) and Infinity. When using Ricoh GR, GR II or GR III Snap and Manual Focus you are telling the camera to focus on a specific point in front of the lens. In Snap Focus mode this point can be set to be either 1 m, 1,5 m, 2 m, 2,5 m, 5 m or ∞ infinitely far away. In US feet this equals 3.2 ft, 4.9 ft, 6.5 ft, 8.2 ft, 16 ft. In Manual Focus mode, the focus point can be set anywhere between 6 cm / 2.3 in (GR III), 10 cm / 3.9 in (GR & GR II) and ∞ Infinity. Depending on the chosen f-stop (f/2.8 – f/16) a Depth of Field Zone is created before and behind the set focus point. The Depth of Field Zone represents the space around the focus point in which a photographed object is captured with “acceptable sharpness”. The closer the object is to the chosen focus point, the sharper it will appear on the photograph (assuming a fast enough Shutter Speed is used accordingly). 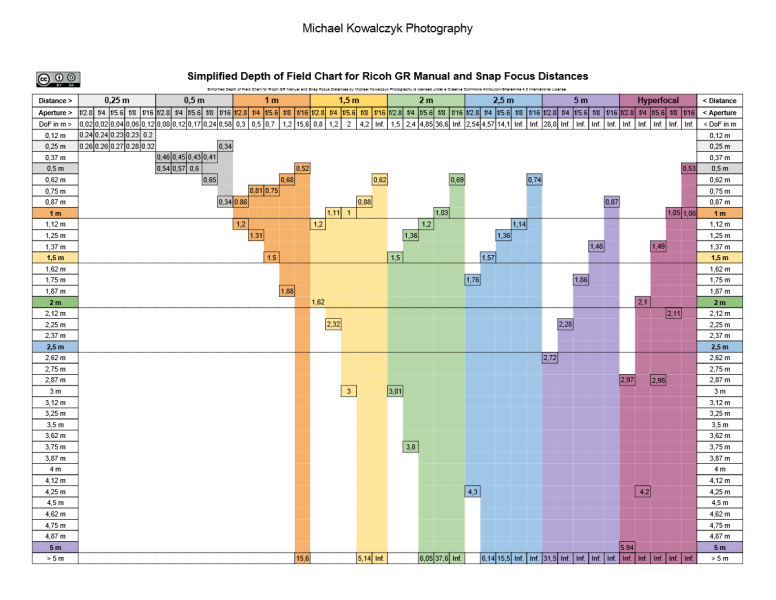 Now lets have a look at the Depth of Field Chart. It allows finding out the usable Depth of Field Zone for a combination of any Snap Focus distance and full f-stop value f/2.8, f/4, f/5.6, f/8 and f/16. You try! Choose your favorite Focus Distance and Aperture value and note the resulting DoF. Notice how different Focus Distance and Aperture settings can lead to similar long DoF Zones. 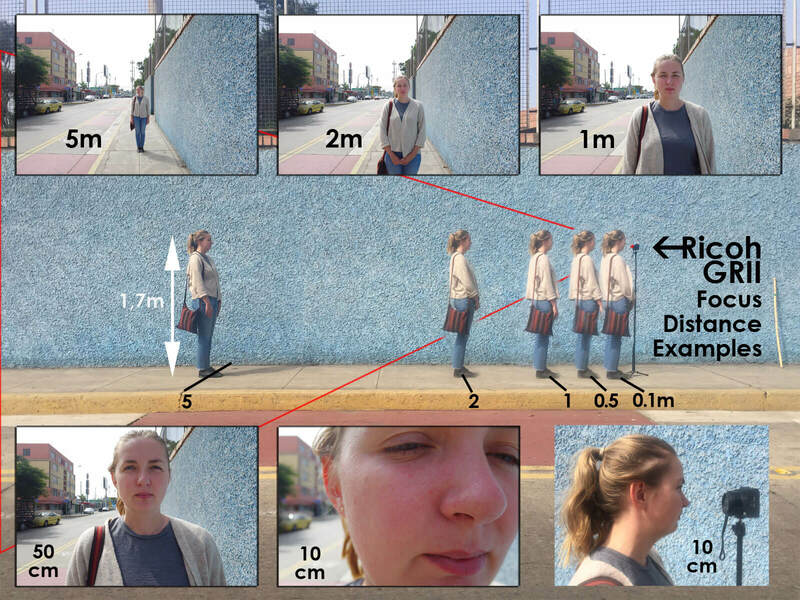 The image below can help to get a better visual understanding of what part of the body will be in the frame when photographing an averaged sized person at a certain focus distance. It summarizes how big a person will appear when photographed at focus distances from 5m, 2m, 1m, 0,5m to 0,1m, the minimum Ricoh GR and GR II focusing distance. Snap Focus is a dedicated focus mode that allows you to shoot using one of the six predefined focus distances. Notice that the selected Snap Focus distance is displayed in the upper right corner of the screen. I recommend using either Av or TAv modes, both respect the chosen Aperture and offer use of Auto-ISO. On the GR III the TAv mode is available in Manual Mode with Auto-ISO. Setting the aperture to f/8 will results in a 4,2 m long of Depth of Field Zone. Check the Snap Focus DoF-Chart for other values or use the Online DoF Calculator. Full Press Snap is a function to directly override Auto Focus and shoot using one the of the six predefined Snap Focus distances. While shooting press the shutter button immediately down to the ground. The camera will omit to Auto Focus and shoot using the Snap Focus distance you have chosen in step 3. 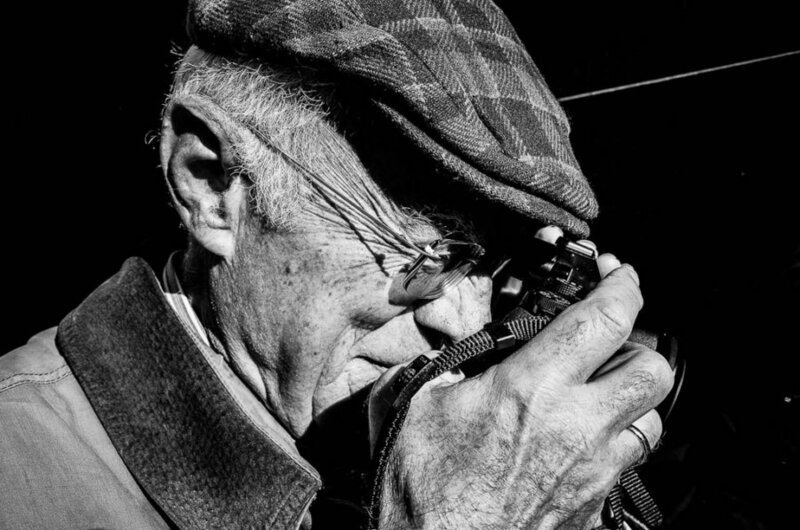 Just like Robert Capa once stated “If your pictures aren’t good enough, you’re not close enough” you will notice that the DoF-Range at the shortest Snap Focus distance (1 m) and minimum aperture (f/16) does not provide enough sharpness in closeup situations. If this is the case you will have to switch to Manual Focus and select a nearer focus point. Manual Focus is a dedicated focus mode that allows you to set the desired focus distance anywhere between 6 cm (GR III), 10 cm (GR & GR II) and Infinity. Notice how the orange distance indicator bar is moving up and down on the lower left side of the display. The depth-of-field zone is displayed as a green rectangle around it. Setting the aperture to f/8 will results in a shallow 0.24 cm depth of field with 0.41 cm of focus in front and 0.65 cm behind the 0.5 m away subject. Use the Online DoF Calculator to get values for other f-stops. Don´t be afraid to get close, stay polite and be creative! Thank you for the question. I have updated the post and added how to use Full Press Snap Focus. This is the mode that is also available in every Auto Focus mode. Let me know if that was what you were looking for! Hello Michael, I’m a bit confused by the Snap Focus and the Full Press Snap Focus. It’s the same thing no ? What I understood on the GR (correct me if I’m wrong…) is that the Snap Focus allows us to keep working with the AF and when we want to take a shot with the Snap Focus, we just full press to bypass the AF. Btw I love how close you get to people. Awesome ! For the photograph with the woman, you were with the camera so close to her face ! That´s right. The GR has a dedicated Snap Focus Mode where you can use only the predefined focus distances AND there is the option to use Snap Focus Mode when you are in Auto Focus Mode. To use Snap Focus you will have to enable it in the Camera Menu first. Then when shooting in Auto Focus Mode press the Shutter Button down fully. That will omit the cameras half-press Auto Focus function and you will shoot a photo using the selected Snap Focus distance instead. Hope that helps you to understand it more clearly. Thank you for your thoughts about about the closeness. 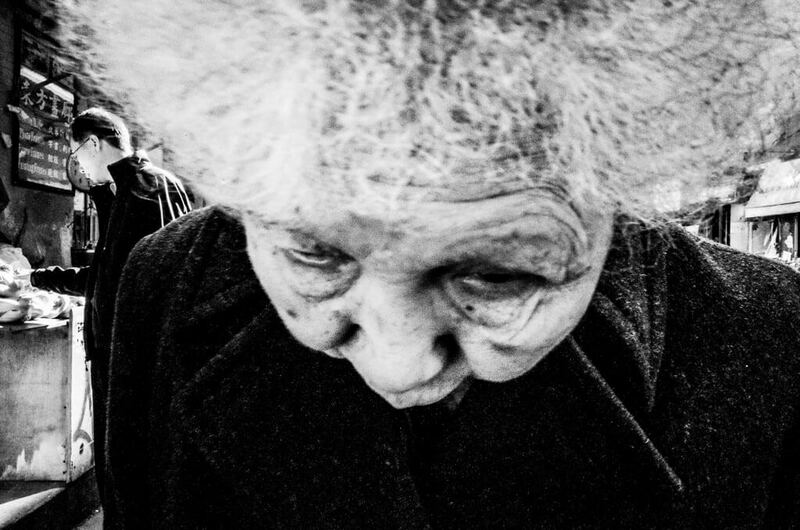 I think it is a style one has to try out at least once when shooting street, just to get a feel for it. Photographing like this happens to be very quick. For the particular picture I was walking in the opposite direction of the woman and raised my arm just before she passed. After trying it I realized that is is too intrusive for my personal taste (except some very special cases). With your chart : f5,6 / distance at 1.5 you say it’s clear from 1 to 3 meters. From DOF calculator its says from 1.3 to 1.7…. Can you please explain me these differences ? Thanks for the question Gilles! I suppose you selected “Ricoh GR” in the online DoF calculator. This is the older model with a 1/1.7″ sensor. To get to the right value you can select Pentax K-5. To my knowledge it uses the same Sony sensor as in the GR and GRII. 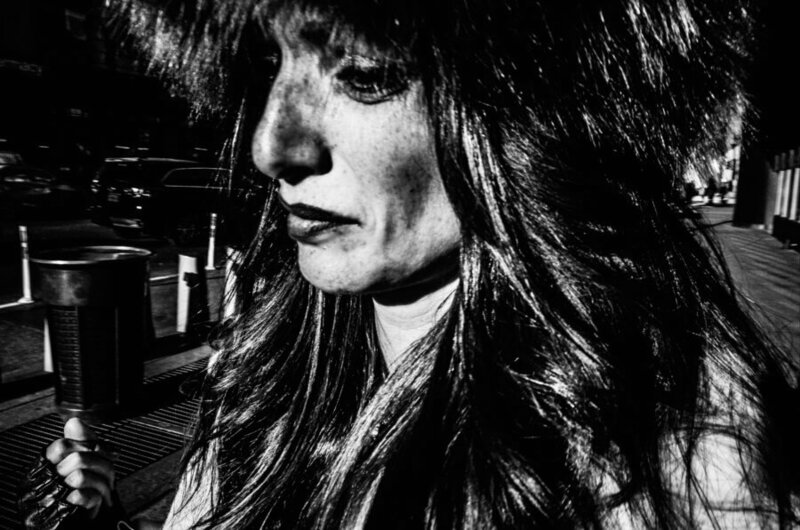 Also check out the Notes under the Ricoh GR DoF Chart made by Gerd Waloschek! Thanks for the chart Michael. I have saved it to my phone for reference. I move too much when shooting, so have been trying Shutter priority at 1/1000 in good sunlight. Anything more than a couple of meters away has been in focus, but it can be an issue in shadows. Looks like f8 is the sweet spot for focusing so I will give that a try instead today. Maybe try 1/500 with auto ISO too. Glad it helped you understand and apply the functions Steven. Today I added another section “Ricoh GR Focus Distance Examples” I hope it will help to get a visual idea in regards to different focus distances and possible results when photographing persons on the streets. An excellent round-up of tips -but what I really loved is the DOF chart! This is extremely useful and I’ve been searching all over the internet for something like that -thank you :) I’ve been using the Ricoh GR ii for almost a year now because I’m a street photographer enthusiast and -mainly- a travel writer. I wanted something light for my journeys and this is hands down the best camera I ever owned. Not sure if I will upgrade to the new version (GR iii) but I think I’ll stick with my current one. The results are stunning. Keep up the good work and thank you once again! Thanks for your feedback George, I am happy to hear that it is useful. I too traveled with the GR II for a year now and must say that it is a great travel companion. Sometimes I wished for a longer lens when in nature. It is ideal for street and documentary purposes for sure. I am curious, did you use the GH-3 lens adapter to protect the lens? I did and so far I had any dust issues. As for upgrading, I am not convinced about leaving the flash behind but I would enjoy making higher resolution images for sure. sorry for the delay, I didn’t get a notification back for your message. To your question, no, I didn’t use the GH-3 adapter. I didn’t have so far any dust issues and I’m glad for it. I read a lot about this issue on the internet. It might have helped that I bought from day one a hard case that keeps it protected. So if I don’t use it for a couple of days in a row, I will have it in the case. In general, I didn’t use any accessory, even though I was really tempted to use the external viewfinder. But I thought of having the raw Ricoh GR experience. I think I can’t get over the fact that it fits literally in your pocket. I also miss the longer lens in a variety of circumstances, but I guess that’s the price you pay for traveling light. Great guide. Thank you very much.